The overall objective of the AEROFLEX project is to develop and demonstrate new technologies, concepts and architectures for complete vehicles that are energy efficient, safe, comfortable, configurable and cost-effective, while ensuring that the varying needs of customers are satisfied by being flexible and adaptable with respect to the continuously changing operational conditions. “By participating in AEROFLEX we wish to grow our network and sharpen our abilities in the field of heavy vehicle aerodynamics, develop novel concepts, and ultimately, strengthen our portfolio of product innovations” – Torbjörn Larsson, Senior Technical Specialist & Team Leader. 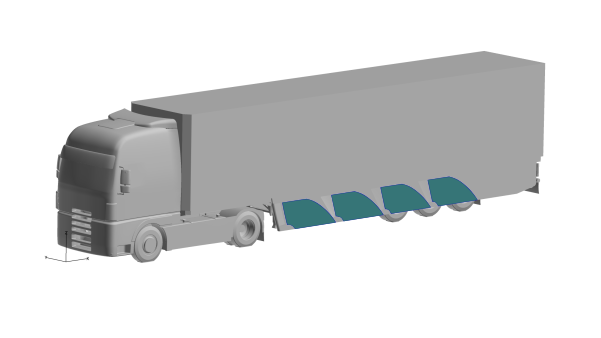 Below, a truck equiped with virtual sideskirts, one of Creo’s innovations to reduce drag that is being evaluated in the project. Partners in the project include, MAN, DAF, Iveco, Scania, Volvo, Michelin as well as several universities and research centers such as Chalmers, DLR, Fraunhofer, etc. More informations on AEROFLEX’s website.